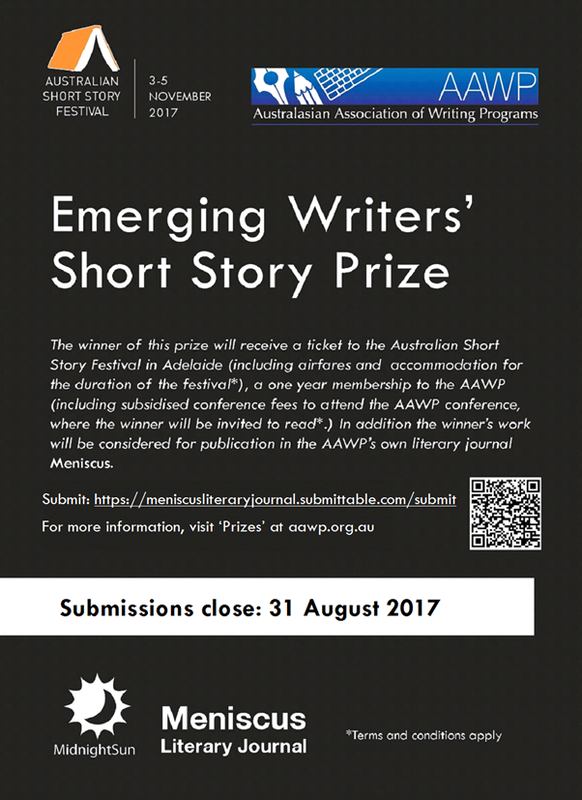 Enter your short story to the AAWP/ASSF Short Story Prize for your chance to win. If you win you will receive — a ticket to the Australian Short Story Festival (ASSF) 3-5 November 2017 (Adelaide), accommodation for the duration of the festival (maximum value $500) and return economy airfares (maximum value $500). In addition, you will receive a one-year annual membership to the Australasian Association of Writing Programs (AAWP) and fully subsidised conference fees to attend the annual conference of the AAWP, where you are invited to read from your work. The editors at Meniscus will consider your work for publication. Take advantage of this stunning opportunity to celebrate the craft of writing at the Australian Short Story festival. Be welcomed in to the thriving community of writers within the AAWP. Enter your short story and take advantage of this generous publication pathway and networking opportunity for emerging writers. This entry was posted in Uncategorised and tagged news on May 22, 2017 by Jessie Seymour.